Nov. 30, 2017 4:00 p.m. 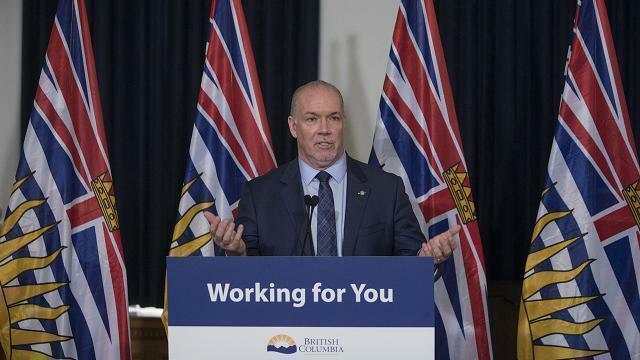 Voters in next fall’s referendum on changing B.C.’s voting system will have a clear two-part question to answer, Premier John Horgan said Thursday. As the NDP-Green alliance prepared to approve legislation requiring a 50-per-cent-plus-one majority to switch to proportional representation for the next B.C. election, Horgan rejected B.C. Liberal suggestions that the mail-in ballot could be skewed in favour of changing the system to benefit smaller parties. The referendum question is still to be decided by the NDP cabinet after public consultations, but Horgan said it will be in two parts. The first part will ask whether voters want to move away from the current system, where the candidate with the largest number of votes wins each of B.C.’s 87 seats. If a voter says yes to that, the second part would set out one or more options, such as the single transferable vote that was defeated in two B.C. referenda in 2005 and 2008. Another possible option, used in Europe, is a mixed member proportional system where seats are allocated based on each party’s share of the popular vote. Horgan defended the plan by Attorney General David Eby to become a neutral arbiter of the choice of question. Both the B.C. NDP and Greens campaigned on moving to proportional representation, arguing it will produce a system that closer reflects voter intentions. B.C. Liberal attorney general critic Andrew Wilkinson has been a fierce critic of the NDP-Green plan, describing the referendum as “rigged” to get approval for the change in a vote that could be decided entirely by Metro Vancouver. Wilkinson, a candidate to replace Christy Clark as B.C. Liberal leader, said the opposition needs to run its own campaign to warn people about the loss of rural representation that would occur if the referendum passes. B.C. Liberal motions to provide a weighted system that needs approval in a majority in all regions, to require a minimum return of mail-in ballots for a valid result, and to make it a yes-or-no question were all defeated by the NDP and Green MLAs Thursday. The NDP and Green parties have committed to campaign for a yes vote in the referendum, to be held by fall of 2018. They have yet to decide whether public funding will go to ‘yes’ and ‘no’ organizations. A website has been set up at engage.gov.bc.ca/howwevote/ to provide information about different voting systems and offer a questionnaire. It will also accept written submissions until Feb. 28, and a Green-NDP task force will travel the province to encourage people to take part.